Don't hate Trevor -- and don't hate me for what I'm about to show you. By now, you'd think I'd be accustomed to the feeling. Just when I think I'm on top of the Bible design and binding landscape, that I have a handle on what's going on out there, somebody knocks me sideways with a photo of editions I've never seen before. In Trevor's case, I'm still on the ground. Let's take a look at another view, top to bottom. "(1) At the top is a JN Darby. Small, zippered, the pages are a really nice size and shape. Some of the word choices in the translation make the Bible strange again. 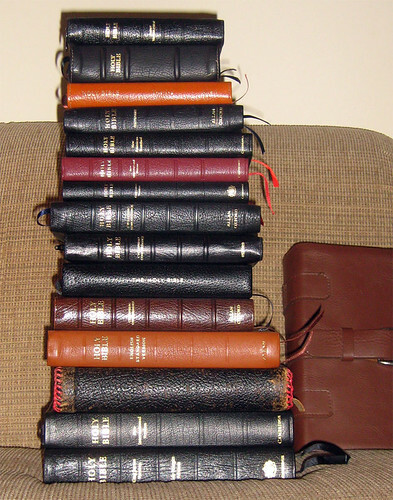 (2) The next from the top is an NASB from LeatherBibles.com in tan and black calfskin. This is the one that I am most inclined to carry. I just finished reading it, although I admit my eyes were tired some nights. The font is a little larger than Cambridge's Pitt Minions. It is a good size and weight for reading in bed. (3) Then follows a TNIV in hardcover tan calfskin from Allan's. The print is quite small. A bit of a revisionist Bible! (4) The KJV Oxford Ruby bound in highland goatskin by Allan's is a pleasure to touch. I often have an ache in my heart because I don't carry it, but the NASB and ESV are better translations for me right now. Later in life I hope to study English literature until the circumlocutions of the KJV resonate for me. (5-7) Next are three Cambridge Pitt Minions: NASB (black), NIV (burgundy), and KJV (also black). I like being able to substitute a bible of the same size in a new translation. My two friends and I have Bible pouches in this size. They are the ones who talked me into burgundy. (11) The next Bible is brown "buffalo grain" goatskin from Allan's, Cameo KJV. Of course, all of these are leather lined. (12) You will recognize Allan's tan goatskin ESV. Wow! (13) Then follows an RSV hardcover that has a nicely fitting bible cover with leather lace. As you see, it has held up well since 1952. (14) The NIV single column bible in calfskin from Cambridge is a luxury I own because it struck me that it might be fun to read the Bible as though it were a novel. (15) Finally, we see a Cambridge Concord Wide-Margin being pressed into the cushion by the weight of its brethren. 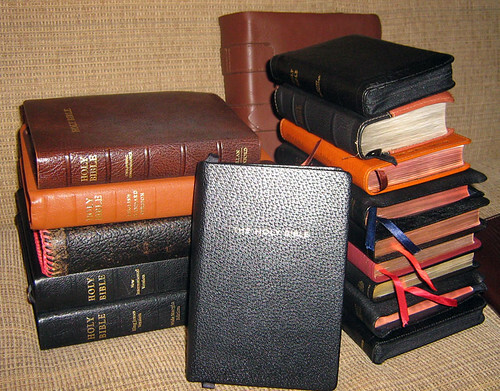 (16) That's a facsimile reprint of the Geneva Bible in the background." "I would like to say a little more about the Smythson's hardcover. I had never really liked hardcover Bibles until I saw one with this quality of leather and binding. Have you considered hardcovers much? It is an entirely different experience. It is not as easy to carry, and there is no question of folding and caressing the leather while you read. But there is solidity here. 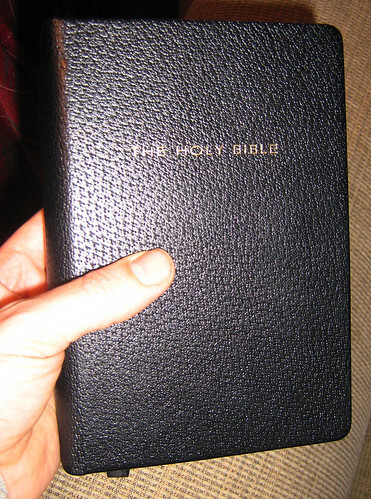 And a hand-sized Bible like this is not at all cold, unfriendly, or imposing. It is rounded and a little bit shorter than the full-yapp binding. It is also a bit thicker, as Smythson has used rather sturdy boards. The silk linings are hypnotic, as is the pattern on the pigskin. When I hold this Bible, I realize that my Bible collection could have gone in an entirely different direction." I'm realizing the same thing about now. A hardcover KJV by Smythson of Bond Street, bound in pigskin? The mind reels. It lists for £150.00. I've never resented the exchange rate more. Thanks, Trevor, for sharing such an impressive collection!